Foucault's Law is the first book in almost fifteen years to address the question of Foucault's position on law. Many readings of Foucault's conception of law start from the proposition that he failed to consider the role of law in modernity, or indeed that he deliberately marginalized it. In canvassing a wealth of primary and secondary sources, Ben Golder and Peter Fitzpatrick rebut this argument. 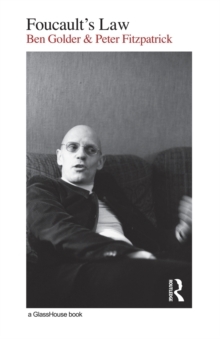 They argue that rather than marginalize law, Foucault develops a much more radical, nuanced and coherent theory of law than his critics have acknowledged. For Golder and Fitzpatrick, Foucault's law is not the contained creature of conventional accounts, but is uncontainable and illimitable. In their radical re-reading of Foucault, they show how Foucault outlines a concept of law which is not tied to any given form or subordinated to a particular source of power, but is critically oriented towards alterity, new possibilities and different ways of being. Foucault's Law is an important and original contribution to the ongoing debate on Foucault and law, engaging not only with Foucault's diverse writings on law and legal theory, but also with the extensive interpretive literature on the topic. It will thus be of interest to students and scholars working in the fields of law and social theory, legal theory and law and philosophy, as well as to students of Foucault's work generally.